Pillars of Freedom pays tribute to one of our nation's Founding Fathers, Thomas Jefferson. 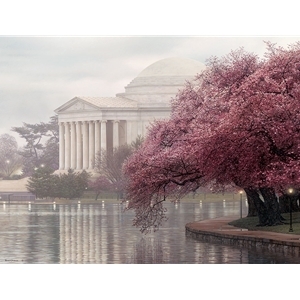 This painting showcases the Jefferson Memorial during the peak of the world-famous cherry blossoms. The trees have become Washington D. C.'s rite of spring with an explosion of pink around the Tidal Basin. Thousands of people from around the world visit to witness the colorful spectacle. Jefferson would be pleased with this gift from Japan in 1912. As an avid horticulturist, he once said, "No occupation is so delightful to me as the culture of the earth, and no culture comparable to that of the garden."